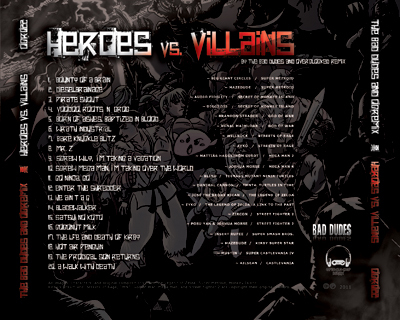 "My approach to the cover for Heroes vs. Villains is rooted in my many years of watching anime through high school and college. There are very similar features to nearly ever popular anime's opening sequence and one I always thought was graphically interesting was a 3-stage, dynamically angled layout with the hero character highlighted in the middle of the composition and the threats and antagonists in silhouette both in front and in the background. This approach is also featured on Wally Wood's famous "22 Panels That Always Work" that hangs above nearly every cartoonists drawing table, including my own. The initial scope of ideas was hammered out in a brief pow-wow with Kunal Majmudar (ktriton) and Christopher Getman (Mazedude) of The Bad Dudes before deciding on the 3-stage layout. After that it was the standard blue-line rough pencil layout, lead finished pencils, inks with a #2 brush and cleanup and colors in Photoshop CS5. All the while, I was working back and forth with Chris, Kunal and input as well from José E. Felix (José the Bronx Rican). 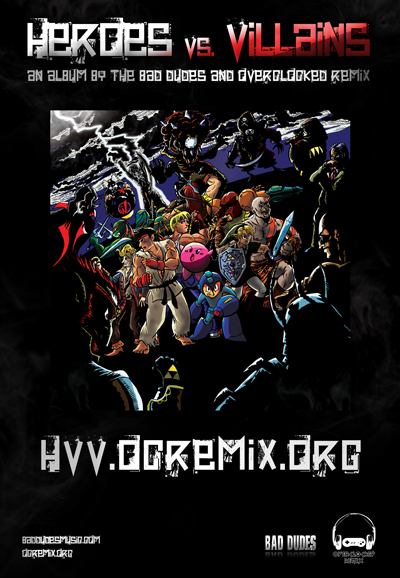 This is my first album cover for the Bad Dudes and OC ReMix and while following in the footsteps of the immensely talented Maximo V. Lorenzo, aka 8BitMaximo, was indeed a tall order, I really enjoyed the challenge. Having the opportunity to draw some of my favorite video game characters and reach an audience I am so glad to be a part of makes this project very special!" 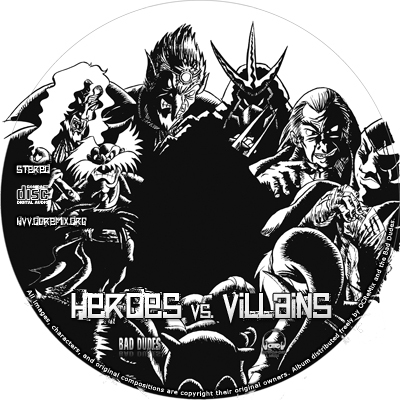 "Since the concept of the cover art was to be a POV of the villains looking in at the heroes, we decided it would be a fun inversion to have the disc art be a POV of the heroes, looking out at the villains. We cheated it a little in order to squeeze more villains in there, but what's a video game project without a little cheating, eh? So, here is some classy black and white art for y'all, and it's nice and large so as to adapt to all the different disc-printing software out there." "Wow, there was enough clamor for a printable tray graphic from you CD people... rather surprised, given this digital age we're in. But, per your request, here's something you can print for your CD trays and such. Enjoy." "Funny how these things evolve. This poster was originally created as a buzz point to be shown off at MAGFest and other events... then, we decided to print up a couple to be given away as contest prizes... then, well, everyone who saw it decided that they also wanted a copy. So we've put it here in beautiul hi-res TIFF format for anyone to download and get printed, in nice and large "18x26" splendor. 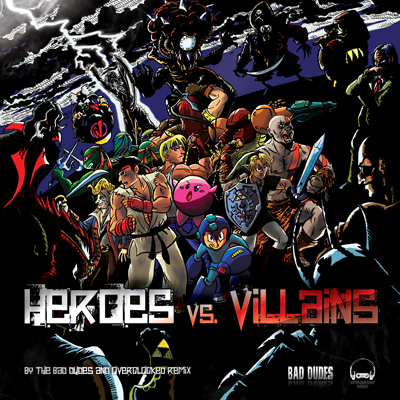 Experience the awesomeness of Heroes vs. Villains on your wall!" * Be sure to download the file to your hard drive, not try to open it in your browser; at almost 45mb, it's pretty massive. Better known as Flozax in the VGM remix community (thanks, Joe Cam...), Randall Drew is a New York-born and New England-raised cartoonist and illustrator residing in middle Vermont. 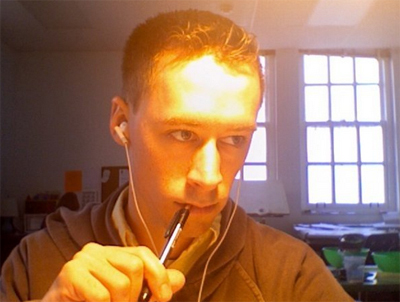 He is currently working on launching his webcomic Citadel, as well as taking on various illustration gigs.